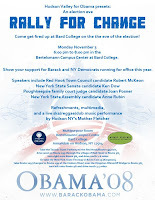 Columbia County Democrats: A Massive Campaign Rally at Bard College! A Massive Campaign Rally at Bard College! Absentee Ballot Deadline Approaching Fast!